It’s been a big couple of months for Universal Music Group. In February, the company announced that its annual 2016 revenues had topped $5.8bn – a record high under the ownership of Vivendi, who originally took control of UMG in 2006. Yesterday, Vivendi admitted that some investment banks had recently slapped a €20bn ($22bn) valuation on Universal, while confirming that it had rejected two takeover attempts in the past five years. Such positive news, of course, has been driven by both the growth of streaming – both achieved, and potential. According to freshly-published IFPI figures, total industry recorded music streaming revenues grew 60.4% in 2016 to $4.56bn. In turn, this growth has driven up the value of copyrights – such as those purchased by UMG in 2012, when its £1.2bn ($1.9bn) takeover of EMI Music was completed. The transition away from a physical music-dominated industry should, in theory, result in leaner and meaner majors – and that’s certainly what’s happened at UMG since Spotify arrived in 2008. 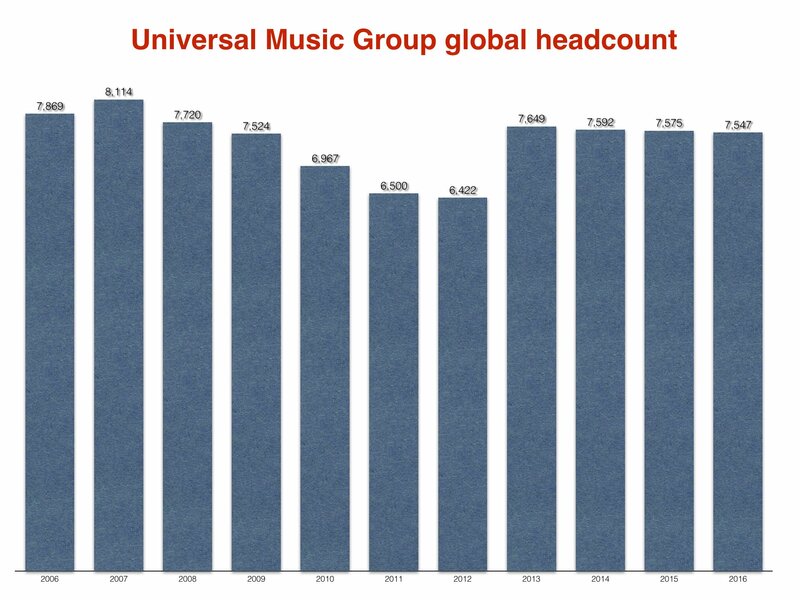 A new report from Vivendi issued this week shows UMG’s total global staff headcount last year stood at 7,547 – down slightly on the 7,575 people employed by the company in 2015. Here’s an interesting fact: MBW has been back over UMG’s total headcount numbers under Vivendi ownership, stretching back 10 years. The high-point came in 2007, when it employed 8,114 people (part-time inclusive) around the world. Within five years, by 2012, that figure had reduced by more than a fifth (20.8%) to 6,422 – a dramatic downsizing of the company in the wake of troubled, piracy-ridden years. As you can see below, this number jumped again in 2013 as the EMI Music workforce were integrated into UMG. Since 2013, though, that net annual employee figure (7,649) has reduced every year. Conclusion: UMG has hundreds fewer employees than it did ten years ago, despite the ingestion of EMI along the way.